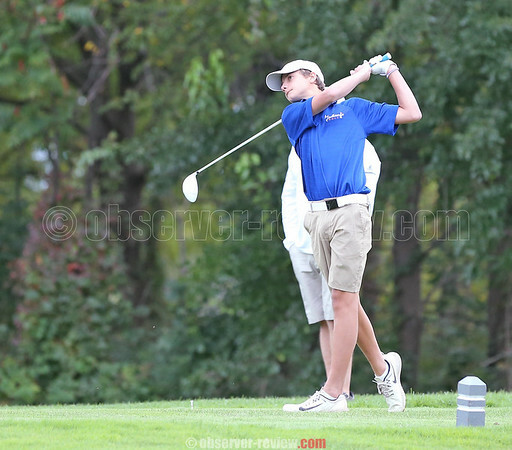 PENN YAN--The Penn Yan varsity golf team lost to Geneva, 223-245, Monday, Sept. 24. Clayton Koivuniemi recorded a 46. Clark Simmons had a 47 including a birdie on hole number 12. The Mustangs' lost to Bloomfield, 230-239, Thursday, Sept. 20. Kevin Smith led for Penn Yan with a 44, getting a birdie on hole number three. Peter Nicholson posted a 45. Max Brodmann had a 49, while Simmons had a 50 and Cameron Bassage added a 51. Penn Yan suffered a loss to Wayne, Wednesday, Sept. 21. The final score was 231-254. Koivuniemi had a 48, followed by Nicholson and Brodmann each with a 49. Smith golfed a 51. The Penn Yan golf team defeated Newark, 234-272, Monday, Sept. 17. Nicholson golfed a low of 41. Brodmann had a 43. Koivuniemi posted a 45. The Lady Mustangs blanked Bloomfield, 2-0, in a home game, Friday, Sept. 21. Brady Logan scored in the first half, with an assist from Sierra Harrison. The second goal came from Hayley Andersen in the second half, assisted by Leah Moniot. Goalie Elle Harrison posted five saves. The Penn Yan girls were beaten by Palmyra-Macedon, 4-0, Wednesday, Sept. 19. In goal, Harrison had nine saves. Penn Yan topped Geneva, Monday, Sept. 17. The final score was 6-0. Andersen led with three goals and one assist. Moniot, Kaley Griffin, and Harrison also each scored one. Griffin and Moniot assisted once. Penn Yan's boys varsity soccer team lost to Wayne, Tuesday, Sept. 18. The final score was 3-0. Goalie Mason MacKerchar had 13 saves, while Oliver Connelly added two saves. The Penn Yan varsity football team beat Palmyra-Macedon, 46-25, on the road, Friday, Sept. 21. Will Rogers was 20-for-28 passing, with 370 yards, five touchdowns, and two two-point conversions. Kyle Berna had eight receptions, for 190 yards, two touchdowns, and a two-point conversion. Conner Fingar also successfully earned eight receptions, for 124 yards, one touchdown, and a two-point conversion. Brennan Prather posted 75 yards over two receptions, while Bryan Duran added 62 yards over two receptions. Each also scored a touchdown. Rushing, Fingar also had 34 yards and a touchdown. On defense, Fingar led with 17 tackles and two sacks. Andrew Garren earned eight tackles and two sacks. Prather tackled six and had two interceptions. The Mustangs' varsity tennis team topped Harley Allendale Columbia, 4-1, Friday, Sept. 21, staying unbeaten this year. Claire Pullen topped Ava Gouvernet, 7-5, 6-3. Sam Denson won against Anna Blake, 5-7, 6-1, 6-0. Jayden Hollister and Grace Worth defeated Laura Pinkney and Evelyn VanArsdale, 6-0, 6-0. Abby Garvey and Sydney Moravec topped Ella Hocker and Fiona Lutz, 6-2, 6-2. Penn Yan blanked Waterloo, 5-0, Wednesday, Sept. 19. Molly Pullen won against Kandice Tillman, 6-0, 6-0. Claire Pullen defeated Kylee Bedette, 6-0, 6-0. Denson topped Mackenzie Ellison, 6-0, 6-1. Hollister and Worth beat Samantha Merkley and Giavanna White Principio, 6-2, 6-0. Moravec and Garvey won against Abbilynn Saville and Danielle Neinast, 6-0, 6-0. The Penn Yan varsity volleyball team beat Bloomfield in four sets, Wednesday, Sept. 19. The final scores were 25-21, 24-26, 25-23, 25-18. Akiya Brewer had 40 digs and three aces. Lauren Chinski posted four aces, while Serina Sheradin had two aces and 25 assists. Brianna Hawley added 18 digs. Caitlin Wunder earned 20 kills, 20 digs, and two solo blocks. Penn Yan's Joddie Decker led the girls varsity cross country team at Marcus Whitman, Tuesday, Sept. 18. Decker placed first overall (21:51). Maci Nicholson followed in second (22:34), while Grace Murphy was fourth (23:48). Jaina Doyle took sixth (24:38). Paige McKee (26:40) and Jenna Curbeau (27:02) were 10th and 11th respectively. For the boys, Ayden Mowry was fifth (19:50). Connor Moore took eighth (20:17). James Tette was 10th (20:47), followed by Daniel Jiang in 15th (22:19). OVID--The Dundee girls varsity soccer team fell to South Seneca on the road, Friday, Sept. 21. The final score was 6-0. Karynna Rutledge posted nine saves in goal. The Lady Scots defeated Romulus, Wednesday, Sept. 19. The final score was 3-2. Claudya Lyons, Haille Emspon, and Cheyenne Cummings each scored for the Scots. Shanika Clark, Melina Everetts, and Emma Sipley all assisted once. Rutledge had nine saves. The Scots' varsity football team secured a 28-14 win against Lyons, Friday, Sept. 21. Neither team scored through the first quarter and at half it was a 6-6 tie. Dundee scored another three touchdowns in the second half to take the win. Joshua Cramer earned 94 yards over 15 carries with one touchdown. Austin Brace had 84 yards on six carries, with a touchdown. Preston Cratsley added 61 yards over 12 carries and one touchdown, while Kenneth Empson Jr. posted 56 yards on six carries, with one touchdown. Gabriel Kirkendall carried for 20 yards and added 61 yards on a pass from Cratsley. On the defensive, Cratsley and Brian Kreidler both posted seven tackles. Cramer had six, while Empson earned five tackles and five tackle assists. Preston Cole and Logan Corey each also had five tackles and three assists. The Dundee cross country runners competed at Marcus Whitman, Tuesday, Sept. 18. Matt Wood placed seventh (20:05) and Curtis Moll finished 35th (29:56). The Scots' varsity volleyball team topped Honeoye in three sets, Friday, Sept. 21. The final scores were 25-22, 25-10, 25-18. Megan Sutherland had two attacks, four assists, and one ace. Mackenzie Strait posted two digs, three tips, and six aces. Dalaine Nolan added one dig, three attacks, and one ace. HAMMONDSPORT--The Hammondsport varsity volleyball team improved to a 7-1 record by beating Mynderse, 3-0, Saturday, Sept. 22. The Lakers were led at the service line by Shelby Sherman with five aces and six kills. At the net, Julia Bennett had 10 kills and four aces. The Lakers' girls varsity soccer team lost to Avoca/Bradford, Friday, Sept. 21. The final score was 3-0. Hammondsport fell to Prattsburgh, 1-0, Wednesday, Sept. 19. In the goal, Megan Allen had eight saves. The Hammondsport soccer team was beaten by Campbell-Savona, Monday, Sept. 17. The score was 3-1. Jenna Tremaine scored for Hammondsport, with an assist from Danielle Conley. The Hammondsport boys varsity soccer team fell to Bradford in a home game, Saturday, Sept. 22. The final score was 4-2. Brock Underwood and Chris Becker scored. Zack Davis and Colin Drain assisted. WATKINS GLEN--The Watkins Glen girls varsity swim team took sixth in their own Invitational in the Glen, Friday, Sept. 21 to Saturday, Sept. 22. The 200 yard medley relay team (Peighton Cervoni, Sarah Swinnerton, Amanda Wilbur, and Allie Gibson) placed fifth with a time of 2:02.01. The 200 yard freestyle relay team (Cervoni, Maddy Kilcoyne, Jillian Cantieni, and Gibson) were sixth in 1:50.87. The 400 yard freestyle relay team (Cantieni, Malina Butler, Swinnerton, and Wilbur) finished eighth in 4:20.41. Gibson also finished the 50 free in fifth (26.84). Teammate Cervoni was sixth (26.86). Watkins beat Waverly, 97-84, Thursday, Sept. 20. Gibson placed first in the 100 freestyle (57.48) and 50 freestyle (26.30), while Cervoni was first in the 100 backstroke (1:06.88). Sarah Swinnerton won the 100 breaststroke (1:16.27). The Watkins Glen girls varsity soccer team lost to Spencer Van-Etten/Candor, 8-6, while on the road, Friday, Sept. 21. Hannah Morse had three goals for the Senecas and assisted three times. Danielle Leszyk, Aislinn Klemann, and Haley Dean each scored once. In the goal, Cierra Barber added four saves. "We didn't get the win, but I was really pleased with the effort in the second half," said Coach Scott Morse. The Seneca girls recorded a win against Tioga, Wednesday, Sept. 19. The final score was 10-4. Morse led with three goals and two assists. Taylor Kelly added two goals and one assist, while Abby Congdon also had two goals. Leszyk, Klemann, and Dean each scored one. Brianna Hayes assisted twice. In the goal, Barber posted eight saves and Natalie Edmister had two. The Watkins Glen boys varsity soccer team lost to Newark Valley, Friday, Sept. 21. The final score was 3-0. Coach Nils Watson explained multiple starting players were either missing or suffering from minor injuries. The Senecas blanked Waverly, Wednesday, Sept. 19. The final score was 5-0. Avery Watson led with four of Watkins' goals. Isaac McIlroy also scored once. Ayden Zahradnik had two assists. In the goal, Nate Wickham earned eight saves. The Watkins boys topped Newfield, 2-0, in an away game, Monday, Sept. 17. Zahradnik and Dylan Morse each scored. Both were assisted by McIlroy. Wickham had four saves. Watkins' varsity volleyball team topped Newfield, 26-24, 25-16, 25-20, Tuesday, Sept. 18. Kelsey Kernan posted 14 assists, one ace, two kills, and three service points. Katie Losey contributed two assists, four aces, five kills, and 13 service points. Adrienna Solomon added nine aces, four kills, and 14 service points. Carlie Baker earned two aces, five kills, four blocks, and four service points. The Watkins Glen boys varsity cross country team placed 19th out of 36 teams at the Bob Pratt Invitational, Saturday, Sept. 22, held at the Sunken Meadow State Park. Gabe Planty finished third overall (16:39.61). Max Evans placed 45th (18:47.36), while Steven Gublo was 107th (19:56.49). Ben Swinnerton took 170th (21:25.86). The girls cross country team placed 22nd overall. Kai Sutterby led in 60th (23:34.06), followed by Breanna Carl in 63rd (23:44.15). Makenzie Kellogg finished in 69th place (23:52.29). Maya Somerville was 208th (34:43.61). Sierra Morris placed 211th (35:08.67). ODESSA--Odessa-Montour's boys varsity soccer team topped Waverly, Friday, Sept. 21. The final score was 5-2. Preston Harris scored three goals. Deshawn Johnson earned one goal and assisted twice. Devon Mahaney also scored once. With the win, Odessa's record is now 3-5. The Indians' girls varsity soccer team tied Newark Valley, 0-0, Friday, Sept. 21. Odessa-Montour had seven shots on goal and three corner kicks. In goal, Grace Vondracek posted eight saves. The Odessa-Montour girls varsity swim team lost to Southern Cayuga, 59-34, Thursday, Sept. 20. Tori Reese won first in the 200 IM (2:33.27) and first in the 100 breaststroke (1:19.55). Madison Moss took second in the 500 freestyle (6:58.89). Reagan Reese was second in the 100 freestyle (1:18.70), while Katie Adams finished second in the 100 butterfly (1:22.30). Kara Reese placed second in the 200 freestyle (2:29.30). The combined Watkins Glen and Odessa-Montour football team defeated Thomas A. Edison 46-12, Saturday, Sept. 22. Individual statistics were not provided for the away game. The Seneca Indians improved to 2-2 going into Odessa's homecoming game this Friday against Honeoye Falls-Lima.